The Citizen’s CL-S400DT is high quality and low cost ticket printer that can handle high volume print tasks and capable to work with a large range of media. Whether you need to print admission tickets, tags, labels, or boarding passes, the Citizen’s CL-S400DT is the right printer for you. Give it a whirl, step up and press play to watch how the Citizen CL-S400DT ticket and barcode printer can be the solution you need in your facility. In case you missed the webinar with us today, click in and discover the next generation of desktop printers and how you can maximize productivity in your workflow. Learn how Zebra’s PrintDNA integration and development toolset will provide the ZD420 and the ZD620 an advantage over its competition. Watch now and see how the ZD series will revolutionize the way your organization prints labels! If you have any questions, email us at zdwebinar@barcodesinc.com or give us a call at 866-653-7048 and we will be happy to help! Honeywell’s PC42d and the PC42t is the perfect sized printer for your everyday needs. Whether you are printing out retail price tags, inventory labels, receipts, or barcodes, these desktop printers can help you improve your workforce efficiency. Featuring a easy paper loading design and media auto-centering function that can help save down time. Read about all the special features below and see how the affordable, dependable PC42d and the PC42t can deliver excellent printing results in your facility. Also, reach out to our dedicated account managers to find out printhead replacement program and see how Honeywell Original Equipment Media can save you money with more printer uptime with a lower total cost of ownership. It is important to choose the right ribbon to print on your label. Choosing the wrong type of ribbon can result in a poorly printed barcode label, the ink can smear or fade. There are three types of ribbons: wax, wax/resin, and resin. Please ensure you have a thermal transfer capable printer, we recommend the Airtrack DP-1. It is most reliable, compact, and affordable printer in its class. Determine the proper ribbon size, choose a ribbon that is equal or less than your printer’s maximum print width where is it enough to cover the surface of your label. Below is an easy chart for you to choose the right type of ribbon for your application. 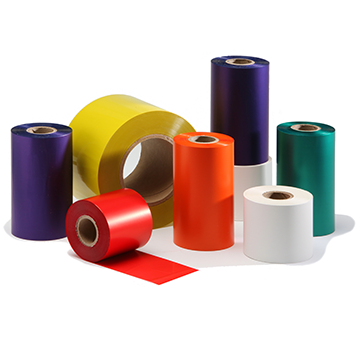 Most ribbons are black, but there are color ribbons available to print your labels in color for categorization. If you are interested in a quote for ribbons or colored ribbons, please contact our dedicated account managers. Why Should You Buy The ZD420 Series? Installation, setup, and management is easy as 1,2,3. Drop the ribbon in place, plug it in, customize your printer configuration, and remote access to all the settings on the printers with Zebra’s printer profile manager. Whether you are upgrading to Zebra or a different printer, the ZD420 can use the exact label formats you use to print with no modifications needed. The design of the printer is so simple anyone can use it. No need to spend time for training during work time, color coding and instruction labels makes ribbon changes fool proof. The result is less downtime, less technical support, and increased worker productivity. With the new 300m ribbon for the ZD420 means four times fewer ribbon changes. This high capacity ribbon means you will be paying less per inch, reducing the cost of your supplies and cost for ribbon changing downtime. Buy the ZD420 printer with the features you need today, and just like legos, you can add features on site anytime to meet changing needs. Whether you need a cutter, peeler, movable media sensor to Ethernet Connectivity, there’s an accessory for you. ZD420 and ZD620 are Direct Thermal printers that advances the legacy of its predecessors, replacing the GK420t, GX420t, and the ZD500t. 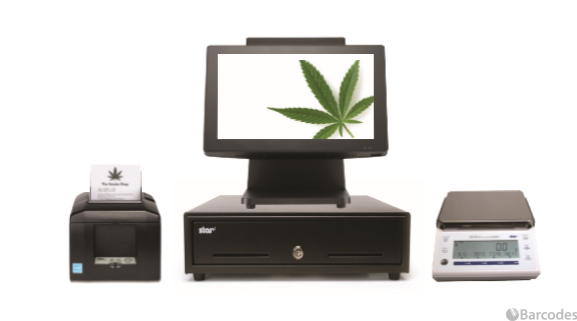 The ZD420, replaces the GK series, offers a fast high-quality print job, an intuitive interface, modern wired and wireless connectivity options, media handling options, and a field-installable connectivity. It’s a 4-inch printer that is easy to use, easy to deploy, and easy to manage. Has a new ribbon cartridge and comes with more status icons that maximize uptime by making the printer easier to use. 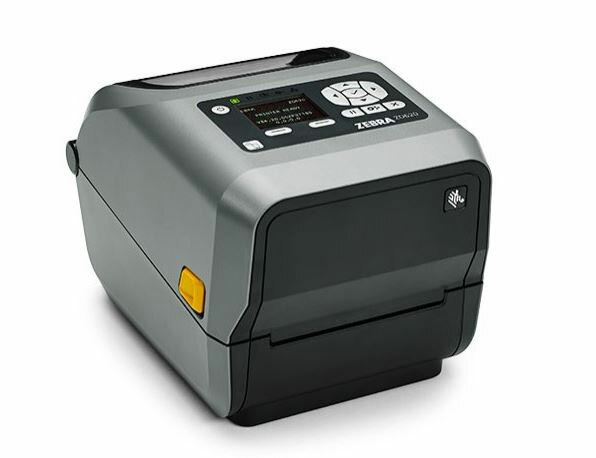 The ZD620, replaces the GX series and ZD500 series, comes with the most standard features of any Zebra Desktop Printers and is designed to meet a wide variety of application requirements. The standard three button user interface with five LED status icons improves the usual single button/single light interface common in desktop printers. Also available is the optional 10-button user interface and color LCD screen. The display will change color when the printer is paused or an error occurs, allowing the users to instantly identify and resolve any issue before productivity is impacted. Ease of use through five status icons to provide enhanced user feedback. Field installable connectivity and media handling options for total flexibility in future deployments. The ZD420 runs Link-OS and is supported by a suite of applications, utilities and developer tools to simplify printer setup, management and monitoring. Support for an extended range of media capabilities through moveable media sensors. High resolution options (300 dpi) for printing small labels and 2D barcodes. Easy configuration and management with an optional 10-button interface with a color LCD. Comprehensive connection options to connect to wired and wireless networks, or directly to a PC. Every ZD620 comes with Ethernet, Serial, USB 2.0 and USB Host, as well as Bluetooth Low Energy (BLE). Print DNA, powered by Link-OS is Zebra’s robust printer operating system, and is supported by a suite of applications, utilities and developer tools to simplify printer setup, management and monitoring. High resolution option (300 dpi) for printing small labels and 2D barcodes. The ZD620 delivers in print quality, productivity, application flexibility, and management simplicity. This is Zebra’s next generation of thermal transfer desktop printers. The ZD620 replaces the GX Series and the ZD500 printers rising above other conventional desktop printers with premium print quality and state of the art of features. With field-installable connectivity and media handling options allow you to purchase what you need today, while giving you the flexibility to add new features on site to meet tomorrow’s needs. Zebra’s ZD620 allows you monitor and manage your printer from the cloud giving you unsurpassed management simplicity. The desktop printer delivers best-in-class print speeds 8 inches per second at 203 dpi output and 6 inches per second at a 300 dpi output. The ZD620 can lower your costs with a high capacity ribbon by having an intelligent dual-ribbon handling that allows the printer to accept either 74m (244 ft.) or high capacity 300m (984 ft) ribbons. The 300m ribbon can reduce ribbon changes by 75% for fewer workflow interruptions. Communication Methods: USB v2.0 (Standard), Bluetooth Low Energy (Standard), RS-232 Serial (Standard), 10/100 Ethernet (Standard), Wireless: 802.11ac with Bluetooth 4.1 (Factory installed option). Print Resolution: 203 dpi/8 dots per mm, Optional 300 dpi/12 dots per mm. Media Sensors: Full width, moveable reflective/black mark sensor; Multi-position transmissive/gap sensor. A printer that features solid double-layer housing, easy paper-loading design, and media auto-centering function. That printer is the compact and elegant PC42d. The PC42d is a powerful and reliable printer that is best suited for low-to-mid intensity thermal printing applications such as electronic express, logistic waybills, healthcare laboratory labels, wristbands, and distribution center routing labels just to name a few. 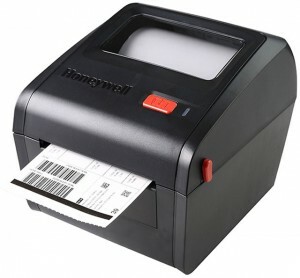 The Honeywell desktop printer gives your operation the flexibility of industry standard connectivity with up to four built-in interface options: standard USB device, USB host, Serial, or Ethernet. With the variety of interface options, the PC42d can easily integrate into virtually any application environment. Printing quality will be an area you need not worry about as the PC42d comes with a high-quality printhead, advanced thermal management algorithms, and broad thermal media compatibility all to give you excellent printing results. The PC42d comes with 128 MB Flash and 64 MB SDRAM which is several times larger than its competitors and supports up to a 32 GB USB expansion. The desktop printer also provides strong data pre-processing and caching capabilities. The ARM926 core and the 400 MHz high-speed processor, the PC42d can process high-volume tasks efficiently.